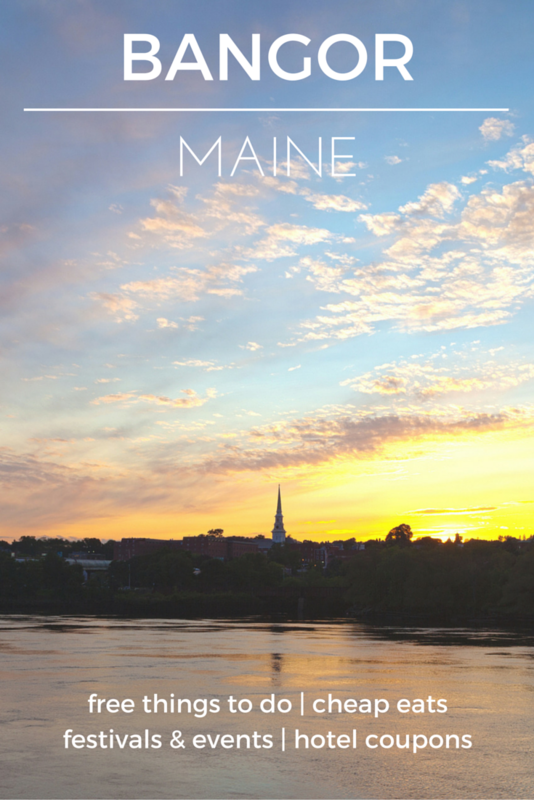 If you’re looking for a truly Maine experience, Bangor is the destination for you. Bangor, Maine is known as the birthplace of Paul Bunyan (although Minnesotans dispute this fact!). Without a doubt, Bangor is home to the origins of logging in America, with its oldest sawmill dating back to 1772. Much of the city’s history has influenced its title, “Lumber Capital of the World”. Many of the city’s attractions can take you on an exploration of the state’s history and culture. Visit the Cole Land Transportation Museum to view cars, tractors, buses, snowmobiles and other vehicles from periods throughout Maine’s history. Next, explore the Bangor Museum and History Center, where the stories of the past come to life. If you’re looking to discover the spooky past of Bangor, Maine, take a popular Ghost Lamp Tour! Or if you’re traveling with kids, the Maine Discovery Museum offers the perfect spot for imaginative play and discovery. Bangor is less than two hours away from Acadia National Park. When driving in the Bangor, make sure you watch out for moose and deer on the roadside. Visitor Bangor City Forest for year-round outdoor activities including, jogging, hiking, biking, snowshoeing and cross-country skiing. There’s no better place nearby to enjoy the natural Maine outdoors. Whether you’re traveling solo, with the family, or as a couple, Bangor Riverfront Park provides the perfect spot for walking, picnicking, playing catch and watching the water. Stroll the walking trails of Cascade Park on State Street in Bangor. Enjoy a quiet picnic overlooking an impressive fountain and gazebo. Dedicated to Joshua Chamberlain, Civil War Colonel and State Governor born in Brewer, Maine, this park was built upon the foundation of an Underground Railroad home. Here, you can see a North to Freedom Statue where the escape route was located, along with a Joshua Chamberlain Statue and more. View permanent collections including Native American artifacts, Mayan ceramics, natural history relics, and much more. The museum is closed on Sundays and holidays. Visit the Maine Forest & Logging Museum at Leonard’s Mills to learn about the history of logging in Maine. You’ll also see the remains of a settlement dating back to the 1790s. The Museum of Art at University of Maine offers exhibits featuring all genres of fine art. The permanent collection features celebrated artists including Picasso, Rivera and Warhol. The museum is closed on Sundays and holidays. Sponsored by the University of Maine, this original building from 1833 now houses artifacts of farming history in Maine. Learn about agriculture, farming technology and much more. Head to the corner of Main Street and Buck Street in Bangor to visit the 31-foot-tall statue of Paul Bunyan. Watch high school basketball at it’s best! The Maine Principal’s Association High School Basketball Tournament is celebrating more than 34 years! Visit local farms to see how real maple syrup is made. You’ll enjoy fresh samples, live music, demonstrations and more. This thrilling canoe race is the biggest one in the Northeast! The finish line is in Downtown Bangor on the Penobscot River, so you can cheer on the racers as they finish. Celebrate Independence Day and view the largest parade in Maine, with more than 1,000 participants. Later, visitors can enjoy fireworks over the Bangor waterfront. Head to Bass Park in Bangor to experience the Maine State Fair! Enjoy shopping and dining from local vendors, exciting amusement rides, live shows, 4-H competitions and much more. Experience the biggest music festival in the Northeast. The festival features more than 75 musicians over four days along the Bangor Waterfront. This three-day event features multiple stages, dance and music performances, craft shows and demos, family activities, and local food and drink vendors. Don’t miss out on this spectacular multi-cultural event. The Bangor Waterfront is home to the Wheels on the Waterfront car show in Bangor. You can register your vehicle ahead of time, or simply enjoy the beautiful cars in the competition. Celebrate Halloween with a real scare at Fort Knox. Fright at the Fort offers spooky fun for the whole family. Bangor Rotary hosts this impressive parade to kick off the holiday season. Watch the parade throughout Downtown Bangor, then enjoy a tree lighting ceremony in West Market Square. Hop on the free downtown trolley service to West Market Square for live entertainment, food, and drinks to celebrate the New Year. Join the street party and watch the ball drop at midnight.